I’ve just got back from Leading Design. One of the key themes from the two days of talks was how important it is to create the right culture. Good design won’t happen unless the culture is right. And that culture needs to include everyone (not just designers). So, we need to be work hard at creating an environment that allows good behaviours to emerge. 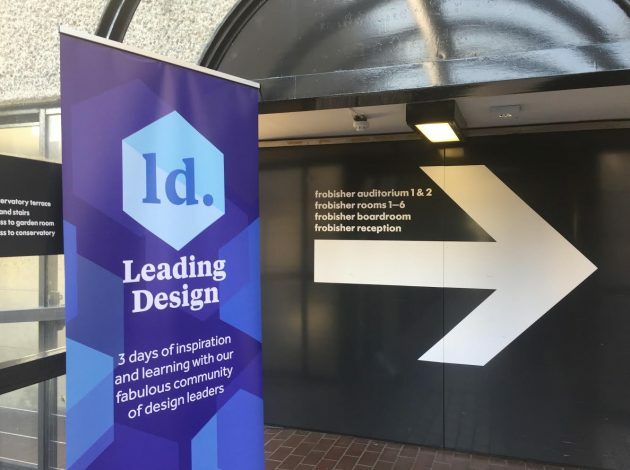 The lineup included Design Directors and Vice Presidents of Design from companies like IBM, Google, Spotify, Co-op and BuzzFeed. Here’s a round-up of the best advice and tips from the conference. Designers need uninterrupted time. Too many meetings can break the focus needed to produce good work. We need this time so that we can concentrate on the little details and the big picture stuff. The physical environment matters too. Breakout spaces, whiteboards and flexible working spaces are important. They help open, agile working practices to flourish. These shared spaces enable multi-disciplinary teams to do great things. And it’s a good opportunity for us to share and learn more about how others work. Good designers should have empathy. Empathy for users comes naturally, but we need to develop empathy for the people around us too. We should make an effort to learn more about the people in our immediate team and in the wider organisation. And find out how design can help these people to meet their goals. To teach others about design, we should open up the design process. Invite others to join in our workshops, sprints and demos. Running a siloed design practice is not a good way to deliver great services. Designers should take pride in every pixel. Attention to detail is important. Never let bad design go out the door. But, we shouldn’t aim for perfection, that’s an impossible target. “Don’t try to be original. Just try to be good” – Paul Rand. Encourage designers to be open and honest. Create an environment where it’s okay to fail, so that we can learn. Create a culture where we’re all encouraged to be curious. Able to ask difficult questions and take risks. These vulnerable character traits are often discouraged in large organisations. But, they should be seen as strengths, not weaknesses. Designers are good for organisations because they think differently. Design is often seen as fluffy and hard to measure. So designers need to be better at talking about the value and rationale behind our work. We are often tasked with solving a problem, so we should be able to talk about how we have solved that problem. We can then invite others to evaluate how successful our solution is. We need to guide and frame criticism. If we don’t, we can’t complain when things descend into the typical “I want the button to be blue”-style debates. I love chatting about design culture. If you have any thoughts please leave a comment or say hello on Twitter.